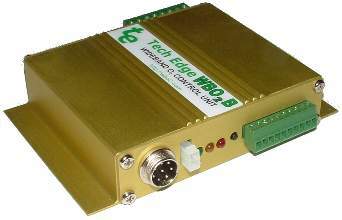 WBo2 version 2B0 (that's 2-B-ZERO) was Tech Edge's top-of-the-range wideband offering in 2005. Now 3B1 has taken over that role. The rest of this page, which constitutes the 2B0 User's Manual, is now for information purposes - see the newer 3B1 here. The 2B0 unit requires a low cost LSU sensor (or use the more expensive but no better NTK UEGO sensor). Optional displays (LA1 or LD02) are also available at low cost. There is no 2B0 DIY-kit but the 2A0 and 2A0 DIY are still available. Accuracy within 0.1 AFR (Lambda +/- 0.005). 10.5 to 19.5 Volt DC operation (up to 3 Amps). Uses LSU 4.0/4.2 (Bosch 6066/7057 family) or NTK (L1H1/L2H2) sensor. 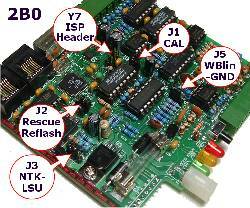 WBlin Configurable wideband 5 Volt output (12 bit accuracy). SVout for LD01 display (10 bit configurable too). NBsim narrowband (10 bit configurable too). 32 k bytes internal (on-board) logging memory and RS232 logger to PC, etc. 3 analogue 0 to 5 Volt inputs sampled at up to 40/sec. RPM input from Tacho or ECU for logging. Free logging software (optional extra feature upgrade available). See the newer 3B1 here. The following information is for existing users. Twice the program memory (16 k words). Differential wideband analogue output WBlin. One input is differential (User-3). 32 kbytes on-board logging memory. WBlin, NBsim & SVout now on screw terminal outputs. Additional serial output for future intelligent display. 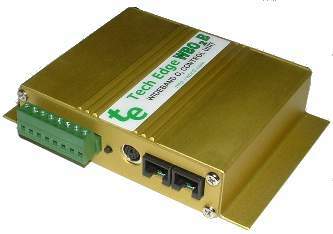 Full RS232 data logging available 100% of time. The 2B0 unit is an evolution of the world proven 2A0 design. 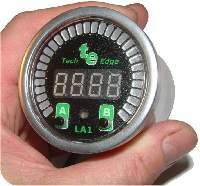 Tech Edge's continual R&D program has improved the sensor drive circuitry to improve measurement accuracy and sensor response speed. As well as good looks it has extra program space to add future functionality via code re-flashing. The new packaging has allowed us to add extra connectors making it easier to hook up and use in the field. Plug-in connectors allow one wideband unit to be used in multiple vehicles. Some inputs are now differential (all thermocouple and User-3 voltage input) to reduce noise and measurement offset errors. The WBlin output is now differential to aid accuracy and reduce offset errors. There's a new 6 pin mini-DIN connector that's ready for connecting to possible future intelligent serial displays. Right now 2B0 currently works with the low cost LA1 and LD02 intelligent display. The image at left shows how 2B0 is connected to other WBo2 wideband components. Some popup images of parts are available. Clockwise from the bottom left, the LSU (or UEGO) sensor is connected via the sensor cable (comes in various lengths for different applications). The sensor cable's circular 8 pin connector mates with the wideband 2B0 unit. 2B0 needs a source of power provided by the two pin power connector. The three status LEDs show basic power, heater and operational status. Beside the LEDs is the logging button that controls on-board logging. Going from the front of 2B0 to the back, there are 18 I/O connector pins spread across an 8 (back) and 10 pin (front) unpluggable connectors. The back has another button, then a circular 6 pin DIN connector carrying a second data channel for a future display. Beside are two RJ45 connectors carrying RS232 data and other signals that are used to provide connection to PC RS232 connectivity and an intelligent display. Shown are the LD02 and LA1 displays. The 2B0 unit, without cables, weighs close to 300 grams, and measures 117 x 110 mm with height of 30 mm. The mounting tabs protrude an extra 15 mm each side and the connectors a further 10 mm back and front. Sensor, power and display cables are compatible with the 2A0 unit but the green pluggable logging & output connectors are assigned differently to 2A0's. As 2B0's major function is to measure AFR (or Lambda), the unit provides three (3) software configurable 0 to 5 volt outputs (WBlin, SVout & NBsim) that can be mapped to the the currently sensed AFR. As well, an RS232 data stream provides digitally precise information on sensed AFR and all logged inputs. These outputs are described in detail in the following paragraphs. Note: Pin 3/8 refers to pin 3 on the 8 pin connector. The most accurate of the 3 voltage outputs is WBlin which is generated by a 12 bit DAC using a 65 word lookup table (with linear interpolation). A special feature of 2B0's WBlin is what we have called a differential output which is designed to reduce the amount of noise and possible voltage offset errors seen by a device connected to WBlin. The WBlin differential output is described fully here. WBlin can be re-programmed using the Config utility to cover any part of the AFR range from Lambda = 0.6 to free-air and 0 to 5 Volt output. The default linear wideband output is shown in the image at right. To convert the default WBlin voltage to an AFR simply multiply the measured voltage by 2 and add 9. This is shown in the graph at left. The advantage of a linear output is that it's easy to write a conversion function from the wideband voltage to AFR. As well as WBlin the SVout & NBsim outputs are available. They use a 10 bit PWM circuit which is less accurate (WBlin is 12 bits) and slightly noisier too. Both outputs can be re-programmed using the Config utility. To generate SVout, the processor uses a 65 word lookup table with linear interpolation. It converts the normalised pump current (Ipx) into a 10 bit value representing SVout. A hardware PWM (Pulse Width Modulation) pin on the processor generates the actual SVout voltage. SVout is compatible with the Vout signal from the original oz-diy-wb unit (and the 1.5 unit's Vwb). It can be used to drive the analogue LD01 display (or the older 5301 if you change its connector). Note that the 12 bit WBlin can be re-programmed to use the SVout table, so if you're not using WBlin and you want a more accurate SVout voltage, you should consider reprogramming WBlin. Remember however that SVout covers the full range of full-rich (Lambda=0.6) to free-air, the voltage range is small (less than 3 Volts) so measuring resolution is reduced compared to using a smaller AFR range over a larger voltage range. The default SVout, shown at right, varies between about 1.0 Volt for a very rich mixture (Lambda=0.6 or AFR=9), to 2.50 Volts for a stoic mixture, and to 3.1 Volts for a lean mixture (AFR=25). In free-air the SVout should be exactly 4.00 Volts when the unit has been free-air calibrated correctly. The default AFR vs. SVout relationship is shown in the Vout table/graph page. 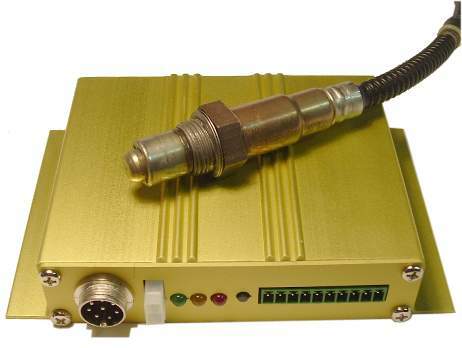 The analogue Vout is a continuously available signal that may be logged with a high speed logger. We recommend at least a 10 bit converter for best accuracy. A synthesized narrowband (NBsim) voltage is produced by the onboard microcontroller using a 10 bit A/D PWM converter (with single pole filter), and a 65 word lookup table. Linear interpolation improves lookup accuracy. The full 0 to 5 Volt output is available, but restricting the output to 0 to 1 volt reduces the number of possible steps to around 200 (~5 mV per step). The NB output is designed to be compatible with the raw output of a Bosch LSM-11 sensor. Refer to this eXcel spreadsheet for the graph of the default NBsim vs AFR. As NBsim can re-programmed it is possible to do a number of interesting things such as fooling the engine's ECU (if equipped with a NB sensor) into running richer or leaner than it would do otherwise. The 2B0 has two RJ45 connectors that carry RS232 and other signals (see below). Each RJ45 carries the same signals. The unit transmits logged data on its Tx line [pin 3 - RJ45] and receives commands (from PC or display) and code updates from a PC on its Rx line [pin 2 - RJ45]. The diagram at left shows the wires within the cable and also the connections at each end. Note the pin names change from left to right - the WB unit's Tx pin transmits to the PC's Rx pin. [pin 5 - RJ45] is the shield for the Rx and Tx data lines as well as being the return data path. Here's an image of the actual RS232 cable for connection between a PC and the WB unit. The cable is used for either logging to a PC, or for re-flashing its code (under control of a PC). The SVout signal [pin 1-RJ45] (pins are numbered from the left) is described in detail above (SVout is also available at pin 2/10). This connection is intended for analogue displays like the LD01 and those displays will also use Vbatt & GND described below. The RJ45 connector signal names are shown at right. A fused, protected and partially filtered battery voltage Vbatt is available from [pin 8-RJ45] (this is the right most RJ45 signal). This output is provided to power other devices such as the LA1 or LD02 display. It should only be connected to devices that will draw small currents; typically less than 100 milliamps. Excessive current consumption may cause heating of an internal 10 ohm dropping/protection resistor. A ground GND point [pin 5-RJ45] is provided as a return for the RS232 and Vbatt connections. Note that there are number of unconnected outputs (N/C = No Connection) on each of the RJ-45 connectors. Those N/C's that have uses on other wideband units are shown "greyed in" and include WBlin (pin 4) and NBsim (pin 6). LSS Tx [pin 1-mDIN] sends data frames to display. LSS Rx [pin 6-mDIN] is not currently supported in firmware. Batt+ [pin 2-mDIN] & GND [pin 5-mDIN] provide current limited power and a return GND for the external display. The normal RS232 data signals Main Rx & Main Tx with data rate at 19200 baud (high speed) are duplicated on [pins 3/4-mDIN]. 2B0 has inputs on both the 8 and 10 pin removable connectors. The front 8 pin connector is dedicated to 4 differential inputs (3 are thermocouples) whereas the back 10 pin connector has a few inputs and more outputs (described above). There are 3 pairs of thermocouple inputs accounting for 6 of the the rear green connector's 8 pins. There are three differential thermocouple amplifiers allowing a temperature range of ambient to just over 1,200 °C when used with standard K-type thermocouples (the 3 amps. have a gain of 101 which covers the output range 0->5 Volts, or input range 0->49.5 milliVolts). Each thermocouple is attached directly to the two screw terminals [left=(+)ve, right=(-)ve] as shown in the image at left. 2B0 also has an internal thermistor that is used to measure ambient temperature so that ice-point compensation can be applied to the raw thermocouple data to give better accuracy. Some thermocouples have screw or bolt attachments and use a single wire. These will work if the green connector's -ve input is grounded at the sensor, but they will be noisier than a true two wire sensor. We don't necessarily recommend these people, but http://www.exhaustgas.com should be consulted to give you an idea of what's available. Check their part number 4018-48-R-W (48 inch long wire, weld on bung, stinger model). Or for their probes look at the bottom of the page for the products they make to suit Westach instruments. All of these probes are manufactured with terminals which suit the green connector really well. The image shows the (+)ve terminal insulated with heatshrink. The tabs on the EGT probe's end wires have been "streamlined" to prevent hitting each other during operation. The K-type thermocouples are made in either a clamp-on style, a weld-on style, a high quality bullet probe, or the stinger probes (2 year warranty). Their bullet probes work on 1000 hp/cylinder top fuel cars and need to last 100 passes. Here's a pop-up image of a hose-clamp style EGT clamp. Thermocouples generate a voltage that depends on the difference between the "hot" junction where two dissimilar metals are joined, and the "cold" junction. Basic data for K-type thermocouples is available from NIST at http://srdata.nist.gov/its90/main/its90_main_page.html. The three analogue inputs (USER1 through USER3) which are sampled at a resolution of 10 bits and at a rate determined by logging configuration parameters. The 3 channels have at least a 10k ohm input impedance and cover the range of 0 to 5 Volts. The 10 bit resolution means variation as small as 5 milliVolts can be detected, but in practice the noise limit sets the resolution to as low as 15 to 20 milliVolts. There are two single ended inputs; USER1 [pin 10/10] & USER2 [pin 9/10] which use the vehicle GND as their negative reference. There is a third inputs that is differential; USER3 [pin 8/8=(+)ve, 7/8=(-)ve]. USER3's (-)ve input should be returned to the ground point near the sensor if the sensor has a single ended output. 2B0 has a single RPM channel that is captured for logging. Two inputs are provided, one for direct connection to a COIL (or a Tach signal as generated by some vehicles) and another for a lower voltage "logic level" signal as is generated by some sensors. 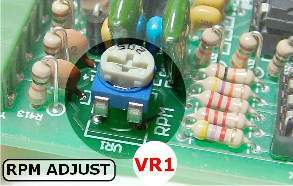 Only one of the RPM inputs can be used at one time. The image at right (click for enlargement) shows the location of VR1 inside the 2B0 case. VR1 can be adjusted to reject high frequency noise signals that sometimes interfere with RPM capture. The RPM COIL input [pin 7/10] normally connects to the wire going between the points and the COIL. On vehicles that have electronic ignition and a distributor, you would connect to the point between the transistor switch (or ignition amplifier) and the coil. The COIL input should never be connected to any voltage larger than 12 Volts or damage to the WBo2 unit may result. The RPM Lo input [pin 8/10] can be connected to any lower voltage signal that produces a 5 volt pulse at some small multiple of the engine's revs. Unfortunately the loading (low input impedance) of the Lo input sometimes makes it infeasible to connect to sensitive circuits such as an inductive crank angle sensor. J1 - Calibration jumper (always on - not described below). J2 - Rescue-Reflash jumper (in the NORMAL position except when rescue re-flashing). J3 - NTK-LSU selection jumper (as for the NTK or LSU sensor used). J5 - WBlin-GND jumper (on to select GND reference, more info. here). Y7 - ISP Header for programming (factory use - not described below). Click on the image or here for an enlarged popup of the jumper-shunt locations. The image at right shows the location of the rescue-reflash jumper-shunt. Click on the image for an enlarged popup. This board has a normal position for the jumper-shunt which is used when the unit is not being re-flashed (or the jumper shunt can be simply removed). Changing the 2B0-to-sensor cable to match the new sensor (see cable information here). Set J3 jumper shunt, for either the NTK or LSU. click on the image for an alternate popup image of the shunt settings. Change the firmware by re-flashing 2B0 with the latest firmware for that sensor. Be very careful to match the J3 jumper shunt's position correctly as using the NTK setting with an LSU, or vice versa, may damage the sensor or the 2B0 control unit. This warning is particularly relevant if you swap from LSU to NTK. The J3 shunt is located close one edge of the PCB and it's quite clear which is the NTK or the LSU jumper side to use. Excessive WBlin+ noise (mostly heater switching transients at 30 Hz) on WBlin+ (with shunt installed = ON when it should be OFF and WBlin- goes to the input amp's GND). floating WBlin+ output that can exceed 5 Volts or go below 0 Volts (shunt is OFF when WBlin- is left floating). Note that the effect of the J5 shunt can be reproduced by wiring pin 5/10 & 6/10 together with a short piece of wire. This obviates opening the case to access J5 (but make sure J5 is off when you need it off). Click on the image for an enlarged popup. GREEN = Power LED indicates power is connected. It should never be flashing. AMBER = Heater Power LED shows the level of power being supplied to the sensor's heater. It should flicker reasonably brightly at 30 Hz. RED = Status LED flashes while the sensor is warming up, to indicate error conditions, and to indicate on-board logging status. Normal Operation : The unit should always have a steady RED LED (unless on-board logging is active - see below). The AMBER LED is brightly LIT but will flicker at 30 Hz (just perceptible). The intensity of the AMBER flicker will give some idea of how much power is being used to maintain the heater's temperature. Normal - Heating : Just after the unit has been turned on the normal heating cycle will cause the RED LED to flash about once a second with a short sharp ON time, and longer OFF time. The AMBER LED will produce a small amount of flicker (30 Hz), but should be brightly LIT. This should last 20 to 30 seconds for a cold sensor. If the time is much over 30 seconds then either the battery voltage may be low or the sensor is placed where it is being excessively cooled by the gas flowing past it. A cool sensor position may result in reduced sensor life and inaccurate measurements. Unlocked PID : It's possible for transient conditions to cause the RED LED to flash off briefly. As long as the AMBER LED and green POWER LED remain on then this is an indication of a PID unlock condition. A PID unlock is not necessarily an error, but it does indicate either very rapid changes in heating or cooling of the sensor, and/or rapid changes in the ambient air-fuel ratio. If this occurs without an explanation (such as rapid changes in throttle position) then it may be an indication of an intermittent somewhere in the wiring, or an aging sensor. The LA1, LD02 and the TEWBlog logger indicate these conditions. The heater PID sharp single OFF flash is shown and prior to rev firmware Rev-48 this single OFF flash was also used to indicate a wideband PID unlock too. This condition indicates may indicate the sensor is positioned where it is either too hot or too cool. A wideband PID is now indicated by a sharp double OFF flash as shown here. If you have earlier firmware and need to differentiate between the two conditions then download the latest HXF flash files and update (note, all 2B0 files start with version number 02xx). 2B0 stores data on-board as well the normal power-up mode of sending a serial data stream to be logged to a PC or other RS232 device. 2B0 can be commanded to save data in on-board mode by operating the logger button shown at left. All inputs, analogue, thermocouple and RPM, as well as AFR are logged. On-Board Logging : The on-board logging memory is a 32k byte EEPROM buffer that stores over 1,150 frame of 28 bytes each. At a logging rate of 10 frames/sec (the default) that's about 115 seconds or just less than 2 minutes. The Logging rate can be varied up to around 50 frames/sec (23 seconds of logging) or down to less than a frame every 2 seconds (about 40 minutes). Logging software can retrieve logged data and send it out the unit's serial port (at 19,200 bits/sec). It typically takes less than 20 seconds to download the maximum data that can be stored. Serial PC Logging & Software : Direct and unlimited logging from the serial RS232 port to a PC or handheld device is performed by default. This allows WBo2 to log and store a virtually unlimited quantity of information. Win32 and other platform Logging software is available right now. On-board logging is also controlled by the LA1 or LD02 intelligent display. These displays have a single button that turns on-board logging on or off with a single press. A combination of short, medium, and long button presses commands the on-board logger to enter one of three states - Stopped, Enabled and Logging. Short press is from 0.2 to 1.5 seconds. Medium press is from 1.5 to 4 seconds. Long press is greater than 4 seconds. slow flash (on-off every 2 seconds) = enabled for logging. double flash (two flashes every second) = logging. a medium press puts the unit into enabled state, then ..
a short press starts or stops logging - multiple sessions are possible. a medium press returns to the stopped state. a long press from the stopped state enters the enabled state AND clears all recorded data (use before a new recording session). We update 2B0 documentation from time-to-time in response to your Feedback.